An eyeliner must be applied near the base of your eyelashes. 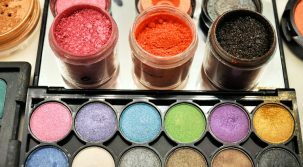 As there are varying products in the market such as cake eyeliner, liquid liner and pencil eyeliner, it is important to try each type so that you will know which type will best accentuate your own natural beauty. Also, to whatever type you prefer, practice the application so you can achieve a very fine line. Remember that it is not a pretty sight when you apply eyeliner in a very thick line. It will look harsh, at the same time loud, making your eyes as well as giving it a tired and heavy impression. Always bear in mind that a thin line is recommended – should you have any trouble applying it, a brush is helpful to smooth out the line and to blend it well. Liquid eyeliners are recommended to be used and should only be used above the top of the eye lashes, whereas an eye shadow or an eye lining pencil is suggested to be used under the eyes lower lashes. This kind comes usually in a bottle with an application brush, almost similar to an ink. This requires great precision during application, but can be perfected through constant practice. A note to remember is to always let the liquid dry before you open your eyes after application – if not, the liquid may smear the top of your eyes and give you a raccoon look. – Begin at the inner corner of your eye. Always be certain to use a light hand when applying your eyeliner, as the area around the eyes is very sensitive and delicate. – Put on your eyeliner only after you have already applied an eye shadow. Doing it before an eye shadow application would only cover the eyeliner. – To achieve a dramatic and intense look, a kohl pencil with a color can be applied above as well as below the lashes, and then followed with black or very dark gray liquid eyeliner at the top. This will give the impression of dark eye lashes and will stay on for the whole day. A dark colored eye-liner will highlight the eyes form and outline as well as give them a deep look. – While holding your head back facing the mirror, look down so that your eyelids will become tight making it easier in applying and controlling the liner. When necessary, smudge. 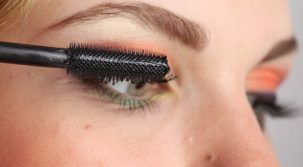 – The eyes will seem larger when you make a line with a pencil under your lower lashes – instead try a dark eye shadow applied with the help of a tiny makeup brush, to give an illusion of darker and fuller eye lashes. Below such line, you need to apply also a thin line with a lighter shade of eye shadow, preferably white, yellow or beige to brighten up your eye area. – Pencil liners may be used on both above the top lashes as well as under the lower lashes. Liquid eye liners however, must only be applied on the top lid. Cake eyeliners are applied with water and may be put on to both the top and so too the bottom of the lid. – If you have beautiful green eyes, try putting on a violet smoky pencil that will enhance your eyes, since basing from the color wheel, violet and green are opposite, so they will compliment each other. – Refer to nature when you are in a process of deciding on a color. Green, beige and burnt orange are autumn colors. – Others prefer using an eye liner not only for the eyes, but the lips as well. Should you decide on this, an eye lining pencil will be most suitable for the application. Make sure though, that you choose a certain shade of somewhat reddish brown or orangey-brown or a brownish plum, to compliment and flatter your lipstick. How To Apply Eyeliner Reviewed by FashionPole on October 7, 2016 .